I walked through the city on Friday night and was swept up by the garish lights; sweet, musty smells; and sardine packed crowds. Seoul really vibrates at night--it's all about flash and glow and chatter. It's like walking through Times Square for the first time--dreamlike and even intoxicating in its audacity. 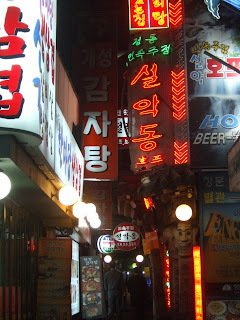 I am assured by those who have been in Korea for awhile that it will eventually become neon buzz and background noise. For now, I find myself laughing out loud because of the energy of it all.